You love buying costumes for your pets? Who doesn’t! According to the National Retail Federation, spending on Halloween costumes for pets hit a record $370 million in 2012, up nearly 20% from previous year’s $310 million. That’s a lot of four-legged outfits. While this number is impressive, it is not exactly fair and balanced news. Unfortunately the majority of this hefty sum of costume-wearing pets discriminates against cats, birds, lizards, fish, rodents… In other words, Halloween costumes have gone to the dogs. 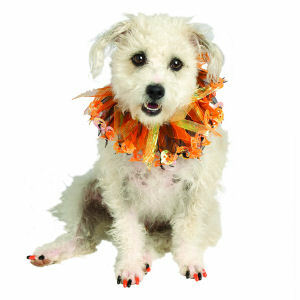 Soft Claws are vinyl nail caps that not only protect your floors, furniture and skin, but also jazz up your pet’s paws with fun colors. You simply glue them on and they help prevent problem scratching with dogs and are an alternative to declawing cats. Like the picture above, you can use these caps to enhance your pet’s costume. I‘d like to see a ferial feline dressed as Lady Gaga. You know from my previous Metro Pets articles that I’m an advocate for pet health insurance. Here we have a trooper dressed as a Chia Pet. 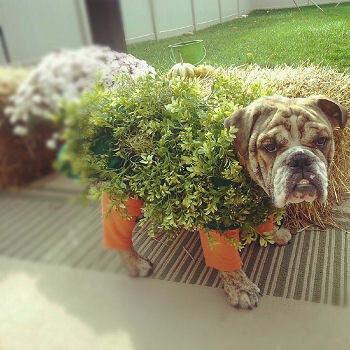 The poor guy may look silly, but his smart owner has him insured with Trupanion Pet Insurance. Imagine if they had to grow this outfit for a Mastic or a Bouvier. Is your pet a geek? How many times have you watched “Star Wars” together? Well, if that set a tail a-waggin’ or received a catcall, check out the Star Wars Hoodies. 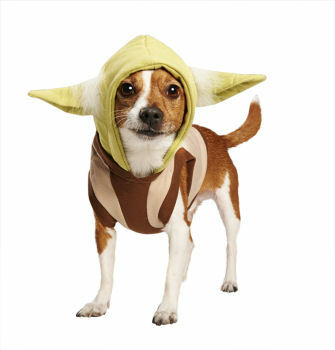 Above we have a wise pooch sporting the Yoda costume. While it’s very convincing, it would be equally amusing to see the Princess Laia hair rolls on a ferret. You can find these hoodies at http://www.Petco.com. Well, the dogs can have the lead this year but I hope that next year we see more Halloween costumes for all of our pets. Following are several of my suggestions.